Rob Partridge (left) and his husband Bradley Rowles. Imagine being able to call a place in which you were not born, and to which you have no real connections, not just “home”, but that, “It said everything to me, and still every day here feels like a holiday”? That has been the experience of Englishman Rob Partridge who has been living in County Galway for the past decade, and he is one of those many ‘blow-ins’ it has been Galway’s good fortune to have, as he is deeply involved in its social and cultural life, particularly in his roles as co-ordinator of the Galway branch of the National LGBT Helpline and as chair of Galway Community Pride, overseeing this year’s Pride festival which takes place next week. Rob grew up in the village of The Glaston, Staffordshire, in England’s West-Midlands. He describes it as “a little country village” with "the usual gossips", and where there “wasn’t much to do”. For a youngster small town life can be tough. For youngster who does not fit in, it’s tougher. When that young person is gay, it’s harder still. Given that The Glaston is within the Birmingham postcode, Rob is happy to call himself a ‘Brummie’. His father is from Birmingham and has a link to the city’s illustrious musical history, specifically Heavy Metal - the genre birthed in the ‘Workshop Of The World’ by Black Sabbath and evolved further by Judas Priest. 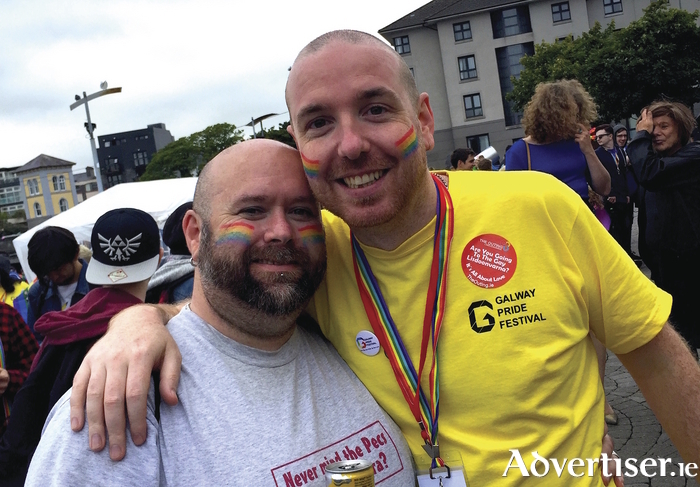 This month marks 16 years together for Rob, and his partner Bradley Rowles - they were married last year. Next month marks another major milestone - their tenth year living in Ireland. What encouraged two Brummies to re-locate to County Galway? Given he has lived in both Ireland and Britain, what differences has Rob experienced in the two countries’ treatment of gay people? “Britain is a lot more open to the idea of homosexuality, or rather was,” he says. “Ireland is now on the verge of overtaking the UK, with being the first country to vote for marriage equality by popular vote, and now there is a gay Taoiseach. The big difference when I first moved over was that, in Birmingham, being gay was talked about. Here in Ireland it was in the background, not much was said. I think the religious side of things here had a big impact on that. The Galway Pride Festival runs from Monday August 7 to Sunday 13, and features music and dance, art exhibitions, a mental health discussion night, discussion on politics, comedy, a family fun day, and the Pride Parade, starting from City Hall at 1.30pm on Saturday 12, and going to Fr Burke Park. Some may ask, given the marriage equality vote, the Gender Recognition Bill, and the Taoiseach’s sexuality being utterly non-controversial, is there still a need for Pride. The responding answer is Yes. Ireland is not a homophobia free zone. Transgender people still face discrimination, and it must be remembered not all of Ireland has marriage equality - the DUP still fiercely resist gay marriage for the North. “From my experiences and from what I have found in talking to other people, the amount of homophobia is still there and it is the same,” says Rob, “but the way it is dealt with is different. We now have more support from our allies. Whereas before, people would have stepped back, now they are stepping in. There are so many subcultures within the LGBT+ community that are ignored or who don’t get the same recognition as the L and the G. We want to embrace all the subcultures and make everyone welcome." "There is an awful lot of Bi-erasure. People don’t want to acknowledge it or they ignore it, or say prejudiced things like, “Bi now, gay later” or that bi people are just greedy - not understanding what bisexuality is. There is also huge amount of Transphobia. I don’t understand the insecurities people have about a person wanting to use the toilet. We all need to. If we all had cubicles instead of urinals it wouldn’t be so big an issue. In France they’ve had gender neutral toilets for years and it isn’t a problem, but really, in terms of Trans rights, toilets are only the tip of the iceberg." While Ireland has made huge progress in terms of how it treats its LGBT+ citizens, the gay community is very aware that in many other parts of the world, gay people face appealing discrimination and violence. The fight for equality is increasingly moving from a national to an international outlook.